In my practice as a learning specialist and educational therapist, I have witnessed that students are receiving less and less writing instruction in school. In fact, it is an academic skill that is requested by most parents, homeschoolers, and young adults that come to see me in my practice. What is my Experience Teaching Writing? Over the past 20 years, I have had enormous success teaching discouraged and struggling writers, and it has taken me much of that time to create all the materials and high tech solutions. This multisensory and highly structured approach works with all students from the gifted to those with learning disabilities. In addition, my methods work for students in elementary, middle school and high school. How Can I Learn to Be an Accomplished Writing Specialist? Now, I'm happy to share my approach with you! 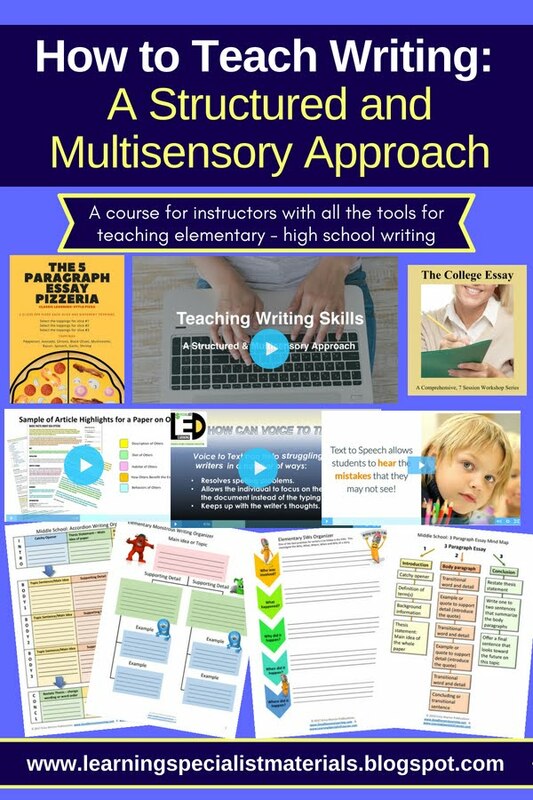 Teaching Writing Skills - A Structured and Multisensory Approach is a comprehensive course for teachers, parents, and tutors that shares my own dynamic methods for students of all ages. The course offers video instruction and demonstrations as well as free downloadable games, materials, and handouts for your students. In addition, I implement and integrate a number of amazing technology tools that keep the process highly organized, and I walk you through the process. You, too, can teach your students to be highly competent and confident writers. Come on over to my landing page to learn more, or you can watch the video below. Do You Have Other Courses? Yes! I now offer 4 different courses!